Our client is a market leader engaged in the manufacture and distribution of the daily use paper-based products. They include disposable diapers, sani-tary towels, bathroom and facial tissues, napkins, kitchen towels, hand towels and feminine-care pads, among others. The challenge was to generate high pressure steam from the Yankee hood exhaust gases. The steam was to be Yankee dryer. The key to the success of the project was to recover the waste heat being lost to the atmosphere without affecting the operation of either the Yankee hood or the Yankee steam system. The Solution: PES offered a very robust and conventional designed fired tubed boiler but modified to work with the new application. The final package included all the ancillaries such as pumps, control valves, dampers and the control system including a PLC control system. 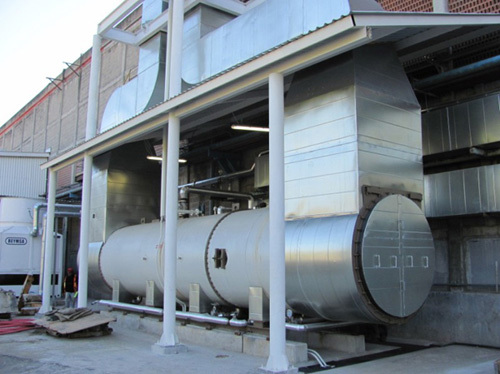 PES worked with a national (Mexican) specialist boiler manufacture. The application was a world first in that we were generating steam that could be used to supply the thermocompressor. However this required vigorous cross checks of all the de-sign data and we worked closely. PES worked both with the supplier and the end cus-tomer to ensure we were going to supply a unit that met the design criteria for steam output. PES also consulted with a Canadian company who are experts in Yankee hood designs. PES has many years of experience working on both steam system and energy systems in general including boilers. PES were able to coordinate the expertise of several fields to provide the best solution. The HRSG produced steam at the design pressure and flow rate and significantly reduced the overall energy con-sumption of the machine. The unit reduced the ma-chine steam consump-tion by around 20% with what is effectively free energy. The unit has been run-ning since September 2010 and has operated without causing any pro-duction problems. Although this application is very specific to tissue making the principal can be applied to other sources of waste heat.